(Korean): The 90FS is a squadron of the USAF assigned to the 3d Operations Group, 3d Wing, Joint Base Elmendorf-Richardson, Alaska, Pacific Air Forces (currently). The squadron flew the mighty F-15E Strike Eagle for many years, but now is equipped with the F-22 Raptor. The 90FS is one of the oldest units in the USAF, first being organized as the 90th Aero Squadron on 20 August 1917 at Kelly Field, TX. The squadron deployed to France and fought on the Western Front during World War I as a Corps observation squadron. During World War II, the unit earned the Distinguished Unit Citation and the Presidential Unit Citation for its services in the Pacific Theater of Operations (PTO) as part of Fifth Air Force. During the Cold War the squadron fought in the Korean War and Vietnam War. 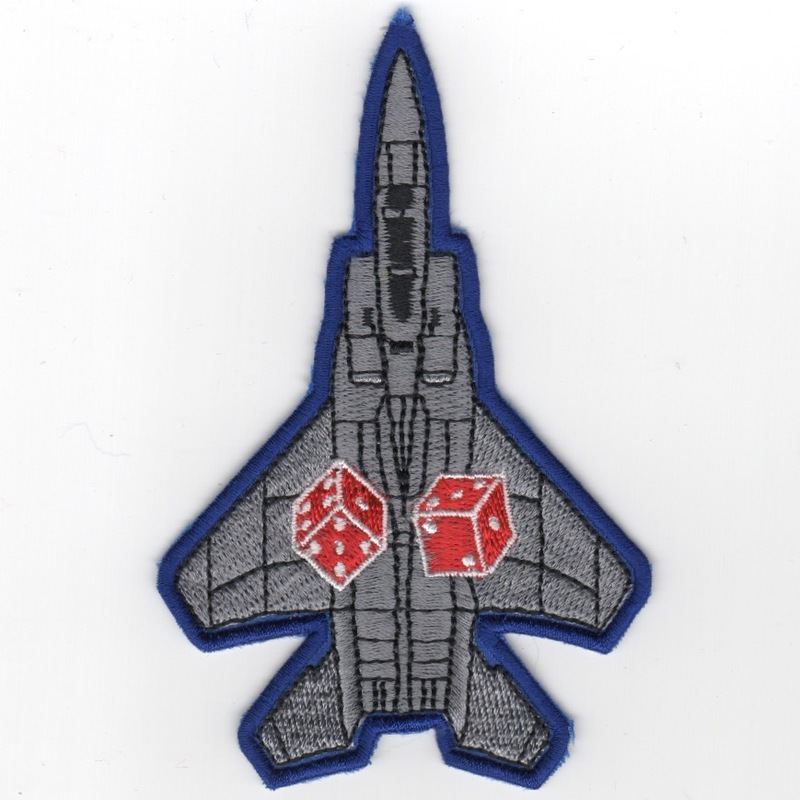 This patch shows the Strike Eagle on a "Pair of Dice", was found in a Korean embroidery shop in very limited quantities and does not come with velcro attached. 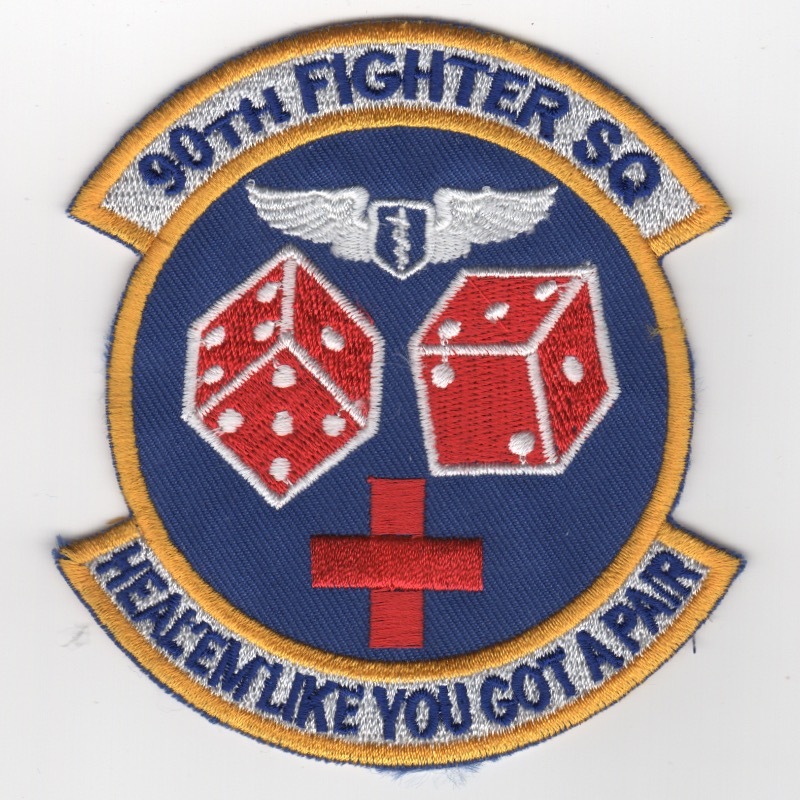 (Korean): The 90FS is a squadron of the USAF assigned to the 3d Operations Group, 3d Wing, Joint Base Elmendorf-Richardson, Alaska, Pacific Air Forces (currently). The squadron flew the mighty F-15E Strike Eagle for many years, but now is equipped with the F-22 Raptor. The 90FS is one of the oldest units in the USAF, first being organized as the 90th Aero Squadron on 20 August 1917 at Kelly Field, TX. The squadron deployed to France and fought on the Western Front during World War I as a Corps observation squadron. During World War II, the unit earned the Distinguished Unit Citation and the Presidential Unit Citation for its services in the Pacific Theater of Operations (PTO) as part of Fifth Air Force. During the Cold War the squadron fought in the Korean War and Vietnam War. 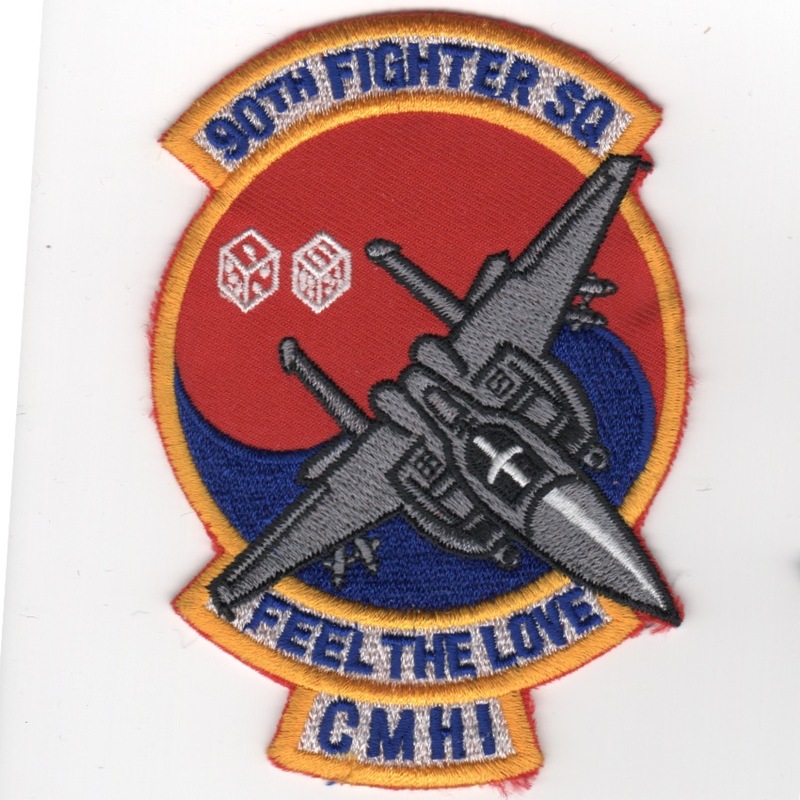 This patch shows the Strike Eagle on a "Pair of Dice" and says "CMH" at the bottom (stands for "CHOW MY HOG"), was found in a Korean embroidery shop in very limited quantities and does not come with velcro attached. (Korean): The 90FS is a squadron of the USAF assigned to the 3d Operations Group, 3d Wing, Joint Base Elmendorf-Richardson, Alaska, Pacific Air Forces (currently). The squadron flew the mighty F-15E Strike Eagle for many years, but now is equipped with the F-22 Raptor. The 90FS is one of the oldest units in the USAF, first being organized as the 90th Aero Squadron on 20 August 1917 at Kelly Field, TX. The squadron deployed to France and fought on the Western Front during World War I as a Corps observation squadron. During World War II, the unit earned the Distinguished Unit Citation and the Presidential Unit Citation for its services in the Pacific Theater of Operations (PTO) as part of Fifth Air Force. During the Cold War the squadron fought in the Korean War and Vietnam War. 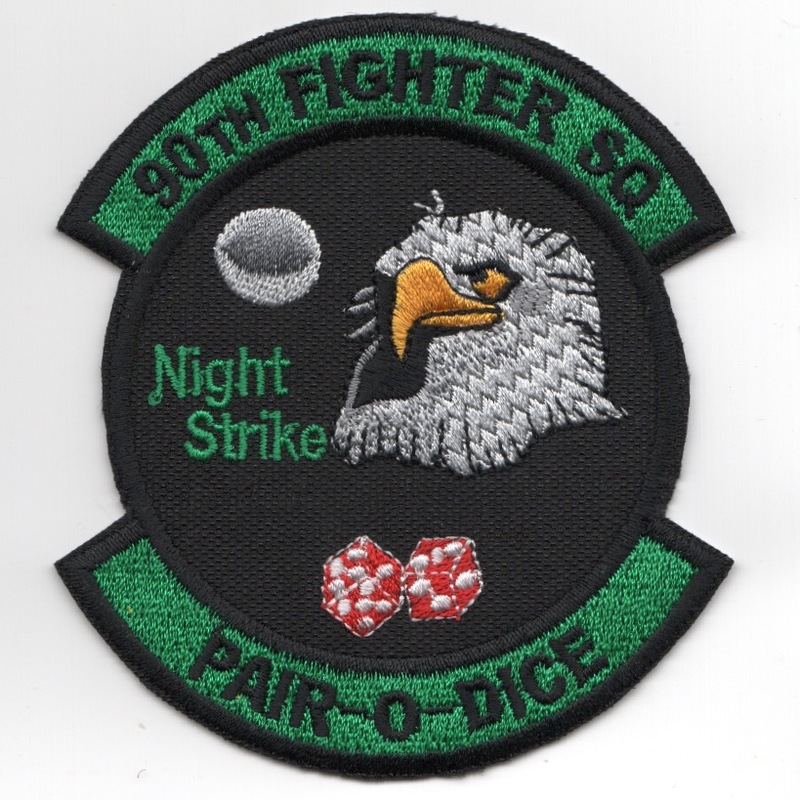 This patch shows the Strike Eagle with a "Pair of Dice", and says "NIGHT STRIKE" on the left side. It was found in a Korean embroidery shop in VERY limited quantities and does not come with velcro attached. I only have THREE of these, so email me to order!!! (Korean): The 90FS is a squadron of the USAF assigned to the 3d Operations Group, 3d Wing, Joint Base Elmendorf-Richardson, Alaska, Pacific Air Forces (currently). The squadron flew the mighty F-15E Strike Eagle for many years, but now is equipped with the F-22 Raptor. The 90FS is one of the oldest units in the USAF, first being organized as the 90th Aero Squadron on 20 August 1917 at Kelly Field, TX. The squadron deployed to France and fought on the Western Front during World War I as a Corps observation squadron. During World War II, the unit earned the Distinguished Unit Citation and the Presidential Unit Citation for its services in the Pacific Theater of Operations (PTO) as part of Fifth Air Force. During the Cold War the squadron fought in the Korean War and Vietnam War. 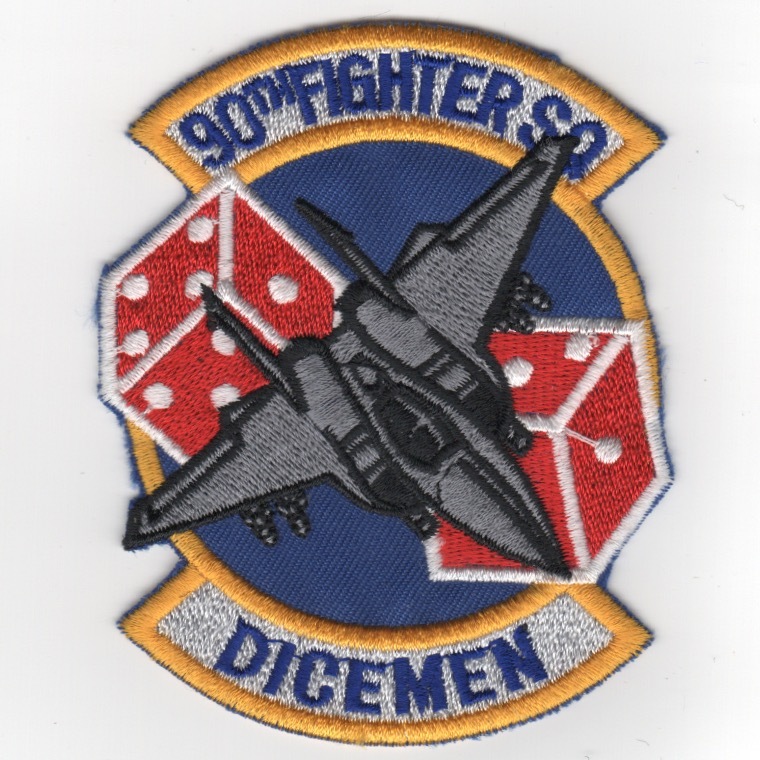 This patch shows the Strike Eagle planform with a pair of dice on the jet. It was found in a Korean embroidery shop in limited quantities and does not come with velcro attached. (Korean): The 90FS is a squadron of the USAF assigned to the 3d Operations Group, 3d Wing, Joint Base Elmendorf-Richardson, Alaska, Pacific Air Forces (currently). The squadron flew the mighty F-15E Strike Eagle for many years, but now is equipped with the F-22 Raptor. The 90FS is one of the oldest units in the USAF, first being organized as the 90th Aero Squadron on 20 August 1917 at Kelly Field, TX. 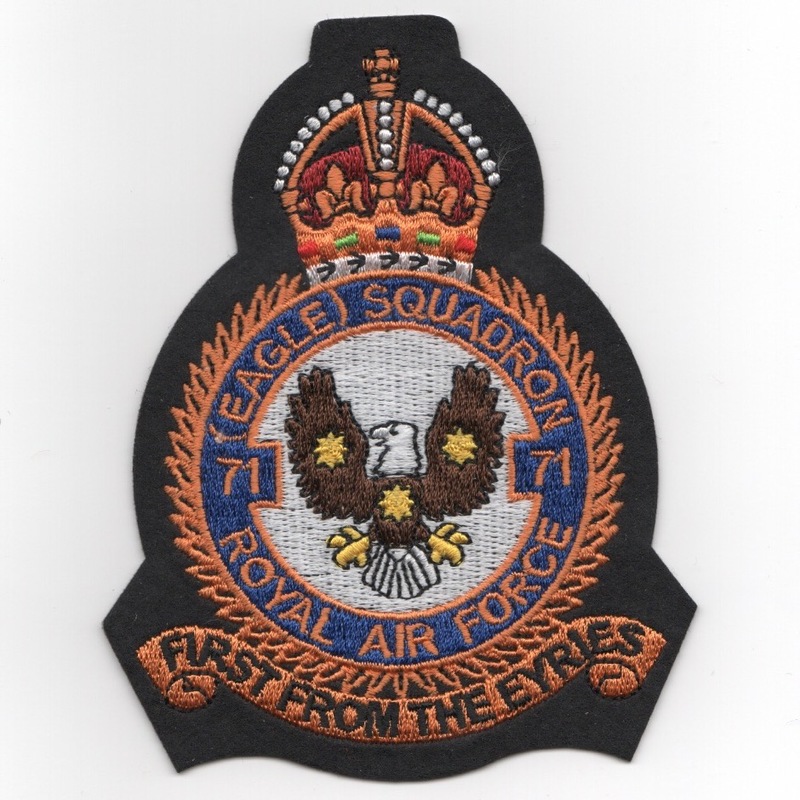 The squadron deployed to France and fought on the Western Front during World War I as a Corps observation squadron. During World War II, the unit earned the Distinguished Unit Citation and the Presidential Unit Citation for its services in the Pacific Theater of Operations (PTO) as part of Fifth Air Force. During the Cold War the squadron fought in the Korean War and Vietnam War. This patch shows the Flight Surgeon wings, a Pair of Dice (represents a man's "pair", with the Red Cross underneath. 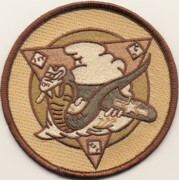 This patch was found in a Korean embroidery shop in very limited quantities and does not come with velcro attached. 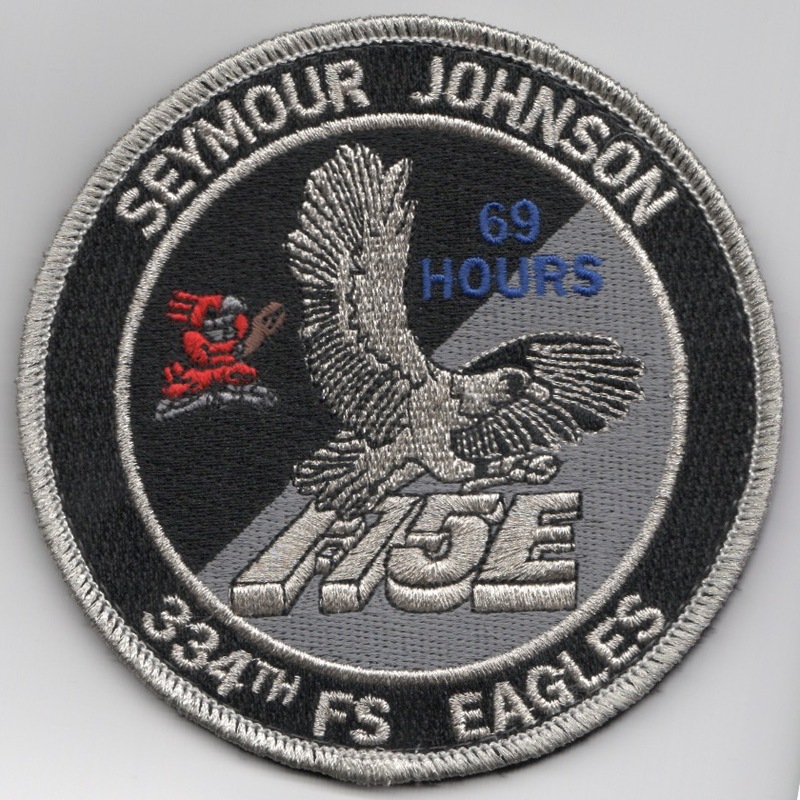 This is the 'blue version' of the standard squadron patch for the 334th Fighter Squadron, one of the F-15E Strike Eagle training squadrons located at Seymour Johnson AFB, NC. This is worn on the left sleeve of the flight suit. In Stock: ONLY 5!!! (Email me to check quantity remaining)!! 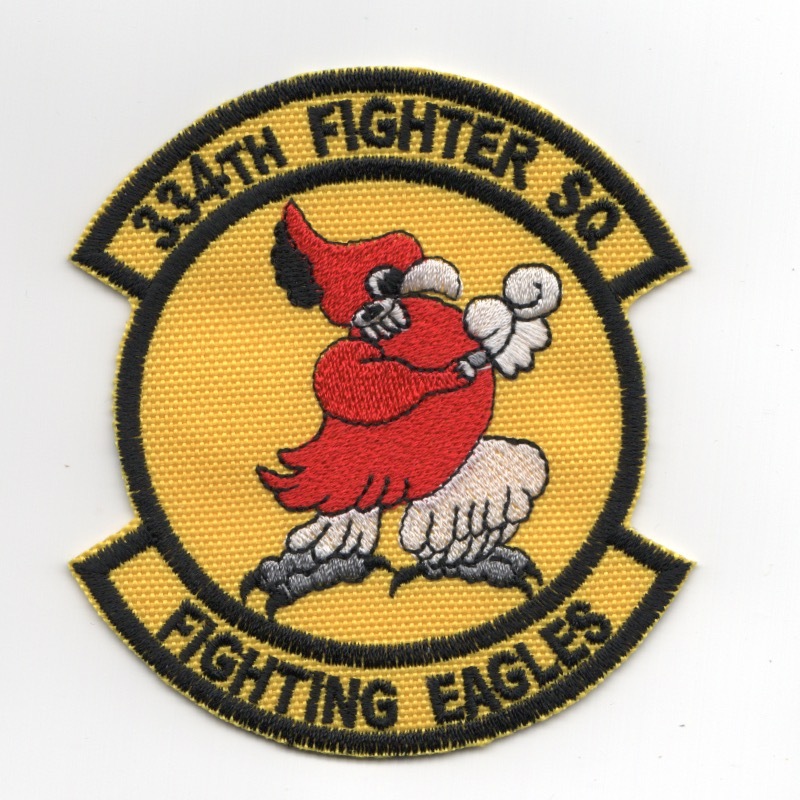 This is the 'small, yellow version' of the standard squadron patch for the 334th Fighter Squadron, one of the F-15E Strike Eagle training squadrons located at Seymour Johnson AFB, NC. This is worn on the left sleeve of the flight suit. I found this at a Korean embroidery shop recently, has that "theater-made" feel to it, and does not have velcro attached.